Famous throughout the world, Lasagne is absolutely delicious with the classic Bolognese recipe; or why not try it with tasty crispy vegetables, and prepare to be delighted. 1 Cut the zucchini, broccoli and bell peppers into small pieces. Sauté the vegetables in a non-stick pan with 1 tbs of extra virgin olive oil, for a few minutes, leaving the vegetables crunchy. 2 Add the Napoletana sauce; bring to a simmer, stirring well. Set aside. 3 Melt the butter, add the flour and stir well. Cook for a few minutes on very low heat to obtain a smooth, brownish cream (roux). 4 In a separate pot prepare béchamel sauce: heat the milk with a pinch of salt and a sprinkle of grated nutmeg; add the not milk to the mix of flour and butter, mix gently and bring to boil. Set aside. 5 Grease an oven tray. 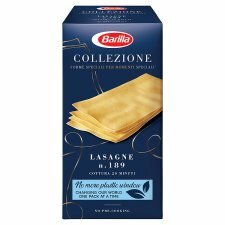 Put a layer of béchamel in the bottom, sprinkle some vegetables on top, set a layer of La Collezione Lasagne (no pre-cooking needed) and a pinch of grated parmesan. 6 Repeat this procedure 5 times, alternating layers of vegetables, Lasagne and béchamel. Finish with béchamel and parmesan cheese (be careful to have enough béchamel to cover completely the top of the fifth layer). 7 Oven-bake for 20' at 220 °C. Allow to rest 10 minutes out of the oven before serving.